Imagine being able to ask the author of your textbook anything you wanted. 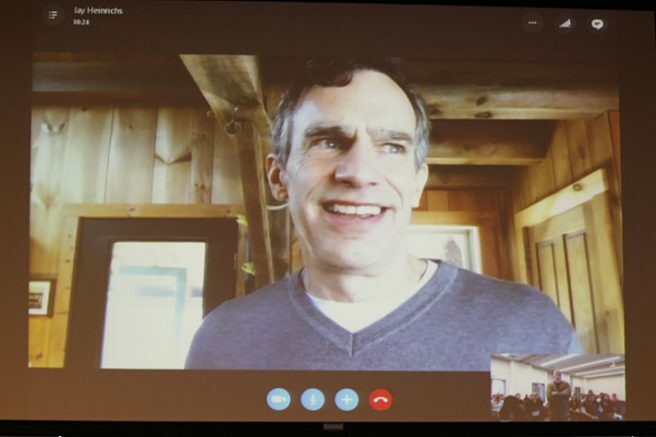 Speech professor David Austin recently organized a Skype call between Jay Heinrichs, author of his student’s textbook, “Thank You for Arguing,” and the students themselves. They had many questions and the resulting class was fun. More teachers should do this. Trying out new teaching methods like this is great. It’s a way to keep class lively and entertaining. Some professors keep to the same schedule and don’t innovate when it comes to teaching. While ARC is a great campus with a lot of great professors, we can always improve. This is exactly what Austin is doing. “As a professor my job is to educate, explain, entertain,” Austin said. He added that as professors only have 16 weeks to do this, it can be hard to accomplish all these things. Teachers don’t necessarily need to have Skype calls with the authors of their books, but they should try out new methods to keep class exciting. When Austin took over the persuasive speech class, he said he tried following in the past teachers’ footsteps, but that just didn’t work for him. He then began to think like a student to improve his class. “If I were a student, what class experiences would make me want to come to class,” Austin said. He then chose a textbook that was affordable and a good read. “Most students keep the book,” Austin said. It was after finding the textbook that Austin sought out the author for the Skype call. Teachers must have passion for their craft. If there is no passion there, then not only will the teacher suffer, but the student too. Students may still find themselves stuck in a loop of reading the text and coming to class unmotivated. Having an interesting book to read for the class is a good step. Teachers should just go out of their comfort zone sometimes and try something new, a philosophy often preached to students. Teachers can spice things up in the classroom by simply making the classroom more interactive. Teachers can also try out group discussions instead of class discussions, showing more related films to the subject or YouTube videos, or even trying games that are related to the subject. Teachers trying out new methods of teaching would add more diversity to the class and keep students more interested than the traditional routine of lecturing with questions. Be the first to comment on "Opinion: Teachers should spice up the classroom"